Your mouth is full of bacteria. Any opening in the tissue carries the risk of infection. The germs from your tongue and mouth can easily get into your bloodstream. 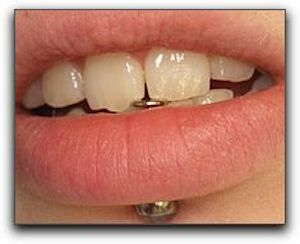 Allen Park dentists and doctors are continually treating serious infections caused by oral piercings. Oral infections can be a real problem, and should be a major consideration before getting an oral piercing. It should come as no surprise that having a piece of metal bang around in your mouth can easily chip tooth enamel. Though tooth enamel is amazingly strong, once it’s chipped or cracked, it can only be restored with artificial material. Fortunately, Szalai & Szalai DDS in Allen Park offers many tooth restoration options such as dental crowns and fillings, but our advice is to avoid the problem if you can. These are just a few of the dangers. Drs. Greg & Joanne Szalai at Szalai & Szalai DDS can give you more information about the risks of oral piercings. If you already have damage, call 313-928-2323 to schedule a consultation. We also offer cosmetic dentistry and restorative dentistry services.